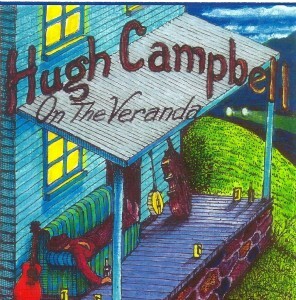 Hugh’s third CD, On the Veranda, is about family, the next generation of the Campbell/Brooks songwriters. Hugh’s brother Zane sings and plays on the CD; cousin Ralph Reed (Ola Belle’s son) sings and plays; one of Zane’s songs, “Fallin’ Through,” is included; one of uncle Wayne Brooks’ songs, “It’ll Be All Right,” is included; “Steer It Straight” is about Hugh’s two daughters; and “Faster than Sound” is about Hugh’s Grandmother Brooks. And, Zane’s artwork (shown below) is featured on the CD insert. It is indeed a family songwriting project, and in our not-so-humble opinion, an exceptionally fine one!